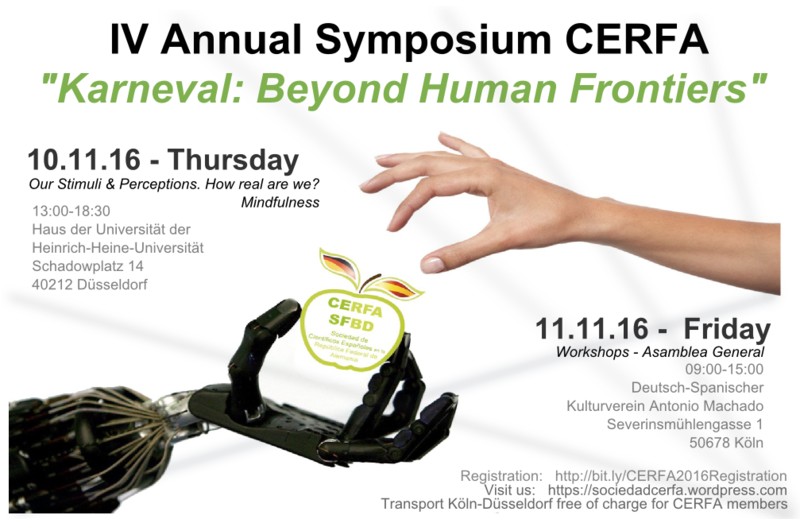 This year the CERFA Symposium will be on 10-11th November in NRW. This date is the beginning of the carnival season, one of the key events in Rheinland. Therefore the topic will be "Karneval: Beyond Human Frontiers". We will talk about how science and technique allow us to transform our bodies and go beyond our limits, as a metaphore for carnival. Attendance to the Symposium on Thursday is free, on Friday a fee of €20 will be charged for non-members of CERFA. For organisation purposes, we kindly ask you to register by following this link. The Cerfa Society invites you to participate in its IV symposium and General Assembly that this year is done on horseback between Dusseldorf and Cologne on November 10th and 11th. of participation open to all the public our event coincides with the beginning of the carnival season, one of the most important events in the Rhineland area and especially in Cologne, which gives its starting gun every year 11.11 at 11:11 and to be Emos very outstanding. On the occasion of this festival, it has been thought of a program that begins on Thursday 10.11 with the symposium "Karneval: Beyond Human Frontiers", where scientists from various disciplines will talk about the impact of excesses and how through science and Technique we can transmute our body and go beyond our own limits, as in carnival with masks and disguises we stop being ourselves. Thus, we will talk about the effect of drugs on the organism, how with the technique we can overcome our biological limitations (synthetic organs, brain regeneration, cyborgs) and present a short that would make us reflect on the extent to which all these Advances can change our concept of "human". That day we will close with a seminar on Mindfulness, where we learn techniques for stress control. Already on Friday 11.11 are invited to participate in two of the four seminars offered on soft skills for scientists about Public speaking (Rhetoric or Present with Pesence) and management (constructive communication or project management). Finally, the General Assembly of Cerfa (members only) will be held. Participation in the Thursday symposium is free. For Friday seminars, a fee of €20 will be charged to attendees who are not CERFA members. For organisational reasons, we thank you for registering by following the link. See you in the Karneval!